Plain high-pressure waterjets penetrate into material in a different way than that which occurs when abrasive is used to make cutting easier. And even with abrasive there are different ways in which the target will react depending on how brittle that it is. In this next segment I will write just about the stages that occur as water alone cuts into a target. In its simplest form consider first a spherical drop of water, moving at very high speed, which suddenly strikes a flat surface. As the droplet impacts the surface, but can’t penetrate it, so the water that comes into contact with the surface tries to flow away along the surface, to get out of the way of the volume of water striking the surface behind it. But in the early stages of the impact (see inset) the edges of the droplet ahead of that lateral flow are coming down onto the surface faster than the water can move that is trying to escape. 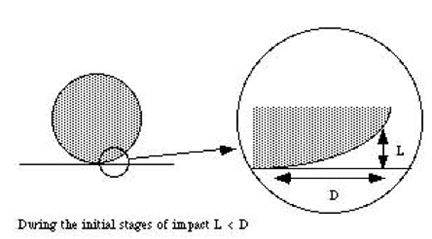 In this range of activity the distance that the edge of the droplet must travel, L, remains smaller than the distance, D, that the water must move to escape. This instantly traps the water and with confinement comes a very rapid increase in pressure along the edge of the drop. This pressure also acts on the target surface, so that it is pushed down a little. 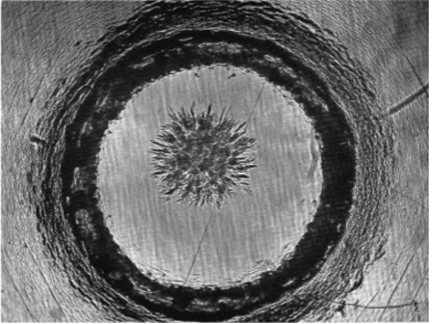 This pressure was first measured by John Field at the Cavendish Lab in Cambridge, UK, who found that it could exceed three times the water hammer pressure that the water might otherwise exert. For those not that familiar with the term, the water hammer pressure is also sometimes called the hydraulic shock pressure, and it can occur when a valve is suddenly closed in a feed line, and this sends a shock or pressure wave back up the line. (This is what can sometimes cause banging in feed pipes). Often there is a small air cushion built into water lines to act as a sponge, when such a shock occurs, since otherwise the repetitive shocks can cause parts to fail. As a very rough rule of thumb, the speed of sound in water is roughly 4,800 ft per second. The jet velocity, to a first approximation, is thus 12 x 200 = 2,400 ft/sec. The Water Hammer Pressure is thus 2 x (4,800/2,400) = 2 x 2 = 4 times the pressure exerted by the water more conventionally. Since that driving pressure was, in this case, 40,000 psi, then the water hammer pressure would be 160,000 psi. With the multiplier that Dr. Field found, this can take that pressure up to around 500,000 psi for that instant of contact. 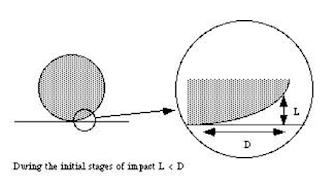 It is, however, only applied to the target at that instant of impact, and where there is the spherical end of the drop to cause the pressure accumulation across the face. It does, however, cause a very high lateral jet to shoot out of the jet, at about the point that the droplet curvature no longer provides confinement (at about 1/3 of the droplet diameter measured radially from the center of contact). John Brunton, also at the Cavendish, has provided photographs of the damage done in that instant of contact. Part of the damage comes from the high lateral velocity of the released water running into the wall of material not compressed under the generated pressure. Mike Rochester found that the diameter of this ring crack closely followed the diameter of the nozzle from which the droplet was released. In our case, however, the jet is not a single droplet, but rather, at least close to the nozzle, a steady stream with the pressure constant across the diameter. Figure 4. Damage pattern around the impact point of a jet on aluminum, target close to the nozzle. 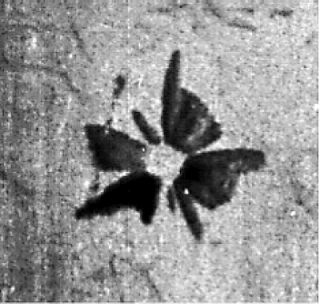 The pattern, close to the nozzle, shows that directly under the jet the pressure is relatively even on the surface of the metal. With no differential pressure across the grain boundaries in that region, the metal is uniformly compressed, and suffers no erosion. 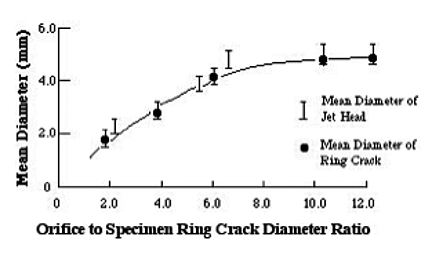 At the edges of the jet, however, there is not only the original ring crack damage created on the instant of impact, but also there is a differential pressure along the edges of the jet, which helps to dislodge those initial grains, and provide crack loci for the water to exploit and remove material as it moves away from the original contact surface. The greatest portion of the damage, at this point lies outside the edges of the impacting jet as the laterally flowing jet erodes material as the jet continues to flow. As the target is moved further from the nozzle, the pressure profile changes from one with a constant pressure over the jet, to one where the central constant pressure region starts to decline in size. Rehbinder calculated the two components of the pressure in the target at the beginning of this erosion process at that point and provided the following mathematical plot. 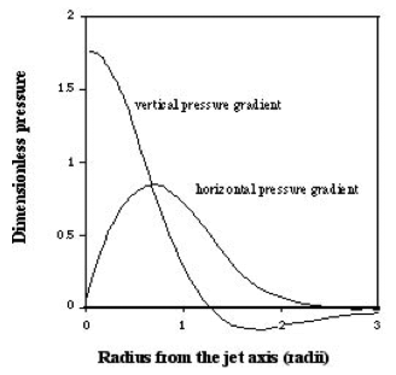 The result of this change in the pressure profile of the jet as it moves away from the nozzle can be seen in the change in the erosion patterns of the jet as it strikes an aluminum target, and that will be the topic for the next post.